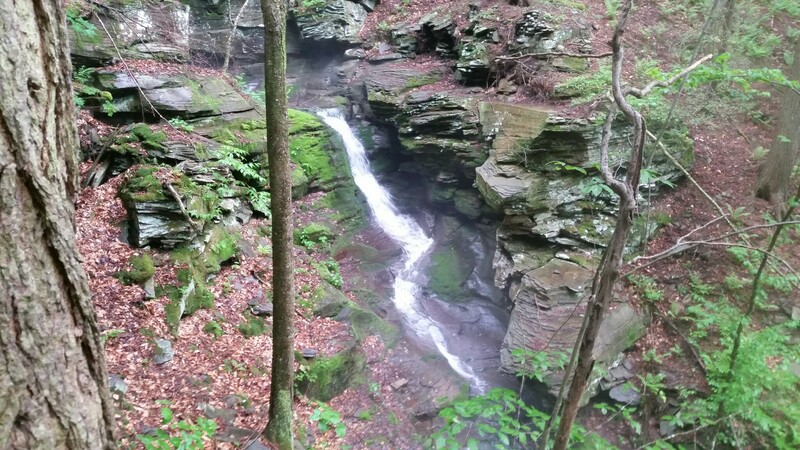 I could hardly wait for the weekend, so excited was I to get back out to the Catskills to run, hike, and explore. When Friday evening finally rolled along, I set the alarm clock for 4:30 AM, determined to get an early start. And I was out the door and on the road in the predawn mist. But when I finally arrived in the Catskills a few hours later, I was dragging. En route I had picked up a second cup of coffee, but even a double dose of caffeine hadn’t helped. I dragged myself to the starting point of the day’s adventure, the trail to Giant’s Ledge, and looked up: the path was a tumble of rocks. After few minutes of very slow progress, it was time for a break. I sat down on a large rock and looked about. 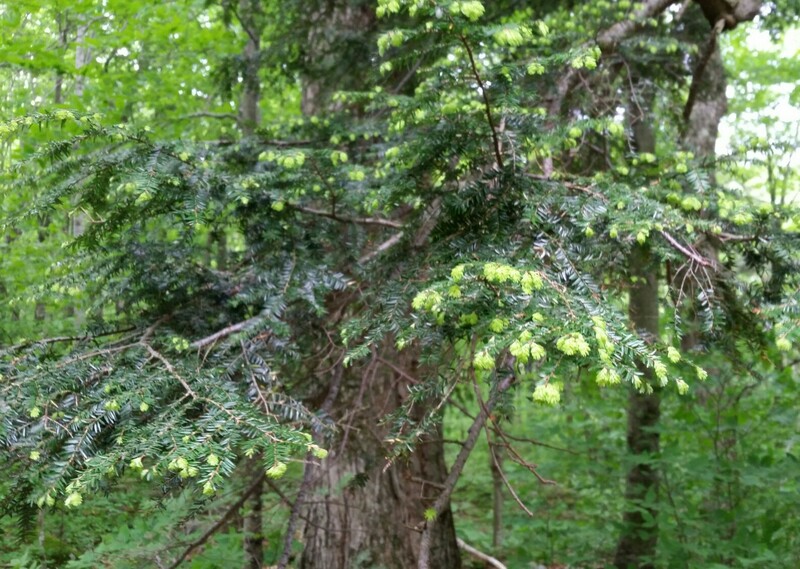 The woods were dark with hemlocks, but there seemed to be points of light floating within the foliage. Upon closer inspection, I made out clumps of newly-growing needles glowing pale green at the end of each branch and contrasting with the shadowy color of prior year’s growth. Further on, I found the same pattern with fir and spruce. I continued my slow progress toward Giant’s Ledge. I had been here before and knew that this vantage point offered magnificent views across Woodland Valley. But I had never noticed so many pink flowers along the trail. I was familiar with the Mountain Laurel that graces the Shawangunks, but these flowers had blossoms with distinctive long stamens. After a little research, I learned they are Pinxterbloom Azalea (Rhododendron periclymenoides), which bloom in the Catskills in late May. 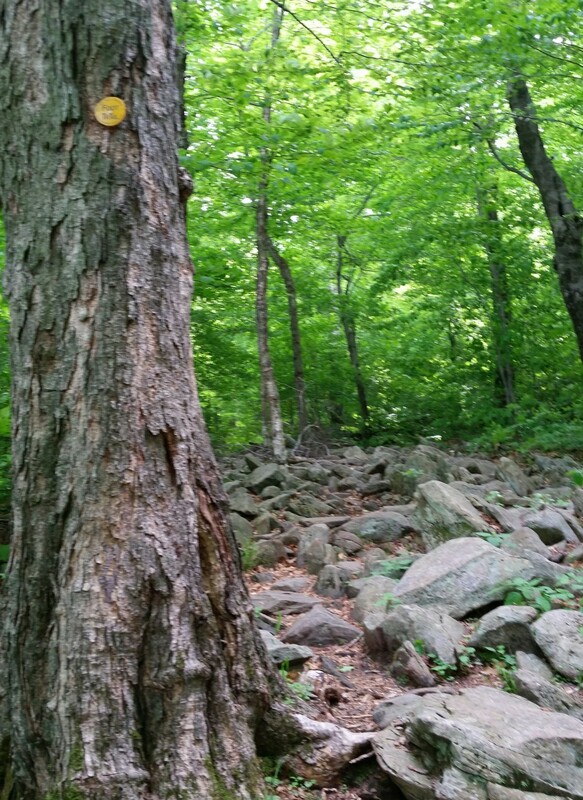 One of today’s goals was to test out a bushwhack route from Giant’s Ledge down to the Esopus Creek and then straight up the far side of the valley to Fir Mountain’s peak. 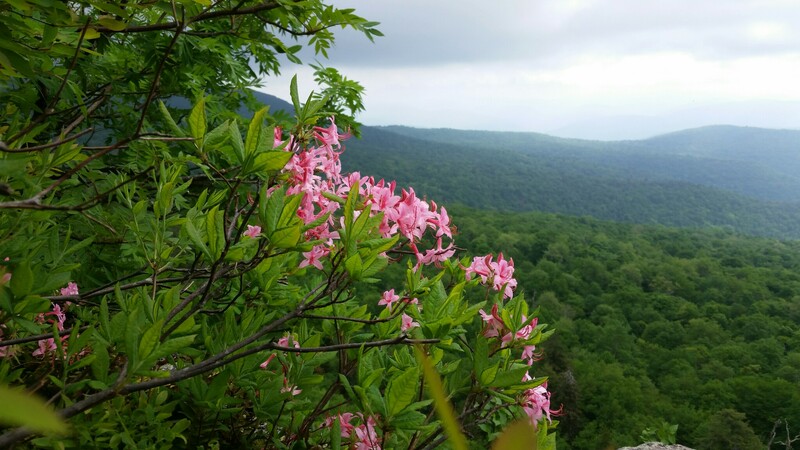 Accordingly, after a final glance at the Pinxterbloom, I turned off the trail and into the woods, pulled out compass, and began to step down the side of the mountain across a series of ledges. Through a break in the forest, I caught a view of the objective looming in the distance. As I continued down the side of the mountain, a black bear appeared about fifty feet to the front. I stood as still as a statue. The animal shambled off to the left. Evidently it had not noticed me, or if it had, hadn’t found me interesting enough to warrant even a sidelong glance. After a few seconds, a second bear lumbered into sight and then disappeared into the overgrowth. I held my breath for another minute, just to make sure there were no more. Soon enough I reached the paved road at the bottom of the mountain, and then it was time for the slog up to Fir Mountain. I was looking for a short cut, and my search started auspiciously when I discovered an overgrown dirt road leading down to the Esopus Creek. But once across the water, the road disappeared, and the slope steepened. I pulled myself up and over rock ledges and threaded my way between thickets of beech saplings and the ever-present hobble-bush, my pace slowing to a crawl. I dared not look at my watch, for I sensed the short cut was not panning out as I had hoped. The afternoon’s plan included summitting Eagle and Balsam, but that no longer seemed realistic, unless I was willing to miss dinner — which I was not. Having reached the small, undistinguished clearing that marks the summit of Fir, I checked watch and map, verified the day’s slow pace, and then turned around and began the long bushwhack back to the road, this time angling down the ridge to avoid the steep sections that had slowed me on the way up. Compass in hand, it took all my patience to follow the azimuth without tripping on roots, falling off rock ledges, getting whipped in the face by branches, or wandering off down the wrong side of the ridge. Making it back for dinner was now the only goal. 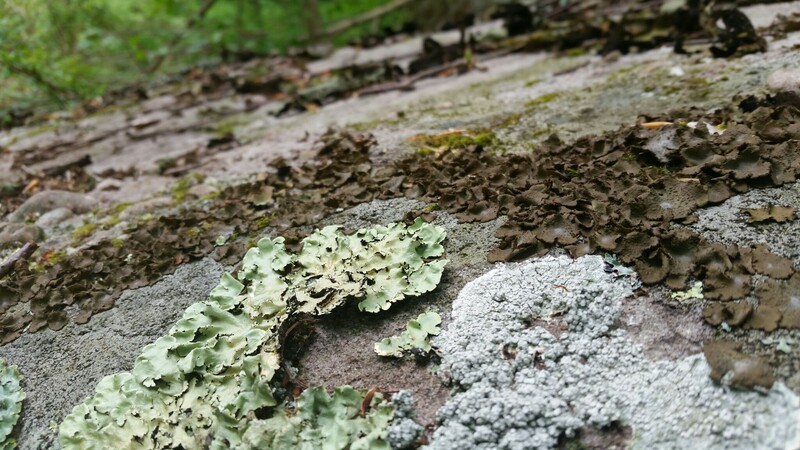 Along the way, I passed a rock with at least four different species of lichen, arranged conveniently so that you could appreciate the different textures and colors (green, white, brown, and grey). 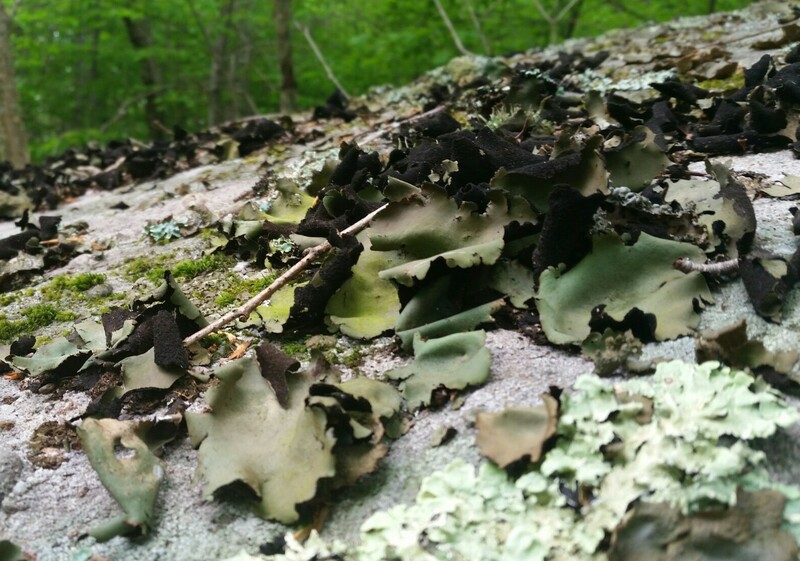 I reached out and touched the large brown lichen (rock tripe lichen, Umbilicaria mammulata). It felt surprisingly leathery. Suddenly I heard the sound of rushing water. The Esopus Creek runs right next to the road, which meant I was just a short walk from the car. Putting compass away, I headed straight for the creek — only to discover that I had veered off toward a stream that feeds into the Esopus. 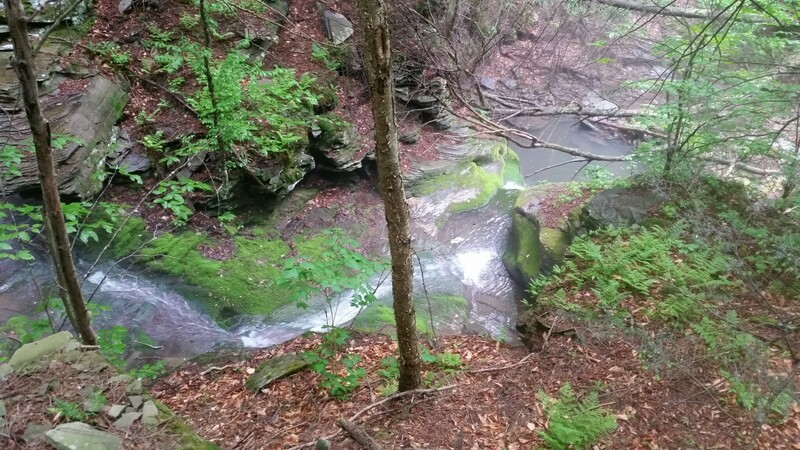 I looked down as the stream flowed through a cleft in a sandstone ledge, then meandered down the slope to pool in a small basin. This discovery made the whole day worthwhile. That evening I had a nice dinner and got a good night’s sleep and the next morning felt much more energetic, practically scampering up the trail from McKinley Hollow along a section of rock steps dug into the steep slope. 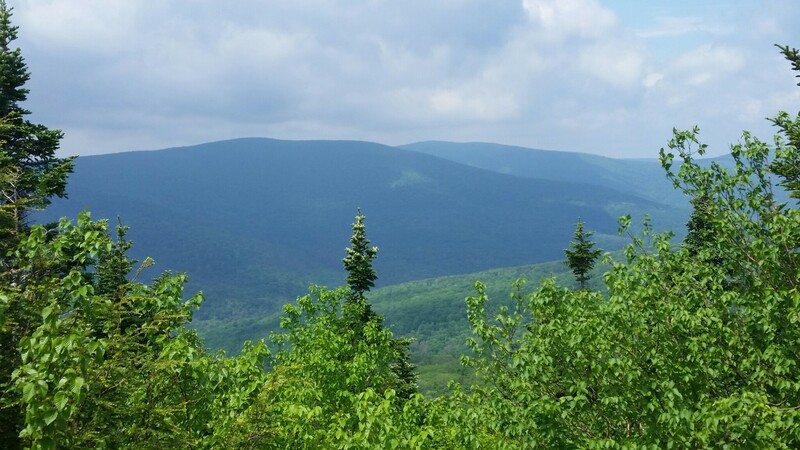 In short order I reached the summits of Eagle and then Balsam Mountain. 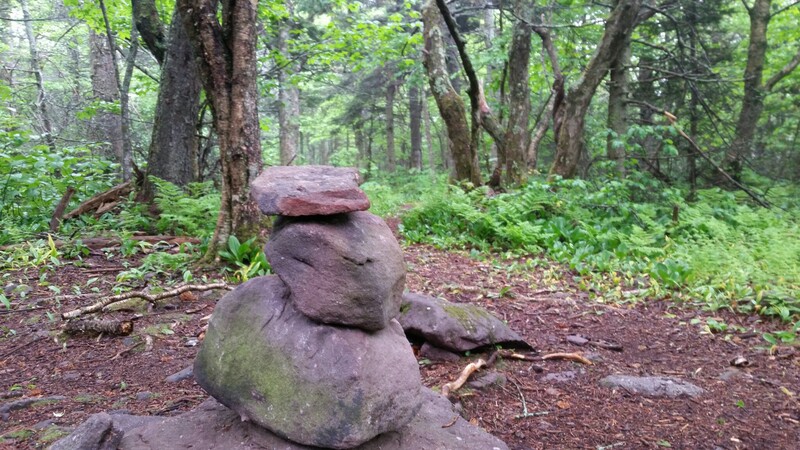 There was no view on either mountain, just a cairn of rocks piled up to mark the summit in a small clearing in the beech forest. A tiny lilly was growing in the shadows of the trees, its small yellow flowers hanging bashfully. 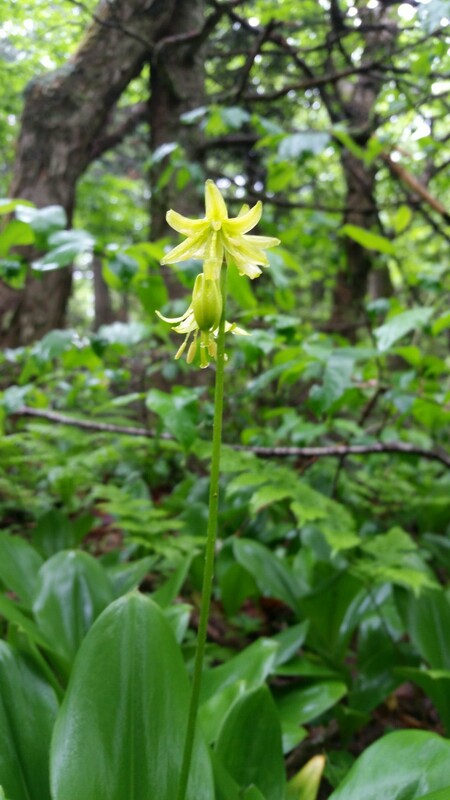 It’s called Yellow Clintonia (Clintonia borealis), and it grows slowly in boreal forests. With these two peaks bagged, it was time to head for home. 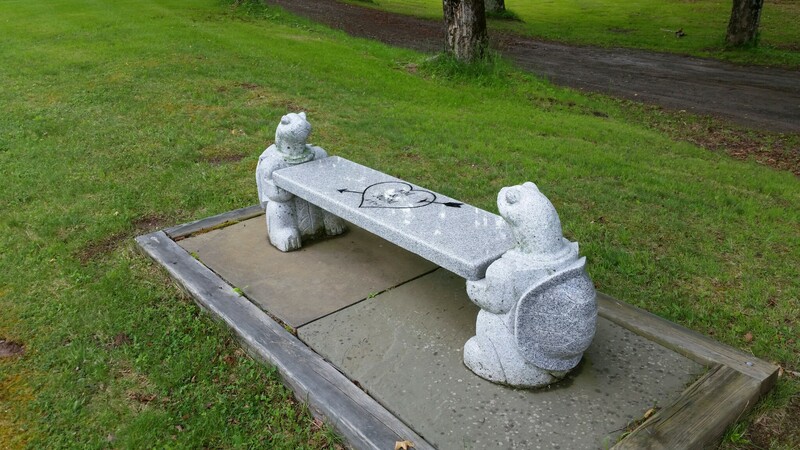 On the drive in, I had noticed a polished stone bench with turtles carved at the ends. The Catskills are full of quirky fixtures, and for once I pulled over to investigate. On the seat were carved two sets of initials, the word “Forever,” and a heart pierced by an arrow. Past the bench, a driveway flanked by stately trees led deep into the forest. Emerging from the mountains onto route 28, I passed the outlet for the Shandaken Tunnel, which carries water from the Schoharie Reservoir to the Esopus Creek. I had passed this tunnel several times, sometimes catching a glimpse, sometimes missing it, but had never stopped. This time I turned around and came back to park underneath a grove of red pine and cottonwood. 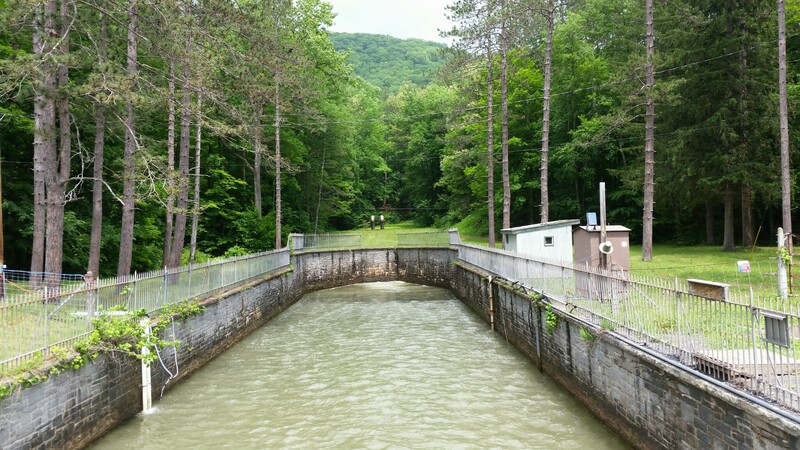 According to an inscription at the site, the Shandaken Tunnel stretches 18 miles to the north and carries up to 600 million gallons of water per day. The water flows into the Esopus Creek, which in turn empties into the Ashokan Reservoir about 11 miles down the road. From there, an aqueduct carries the water underneath the Shawangunk Mountains and the Hudson River to a reservoir in Westchester, from which New York City is supplied. 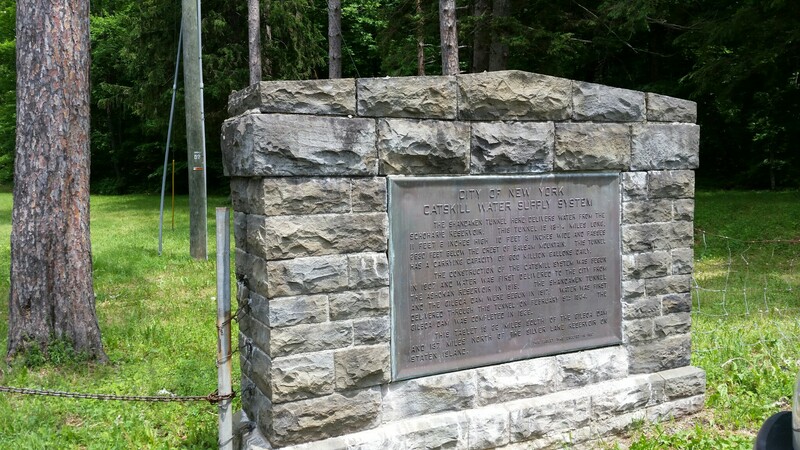 According to the inscription, the Shandaken Tunnel runs 2,600 feet beneath the summit of Balsam Mountain. 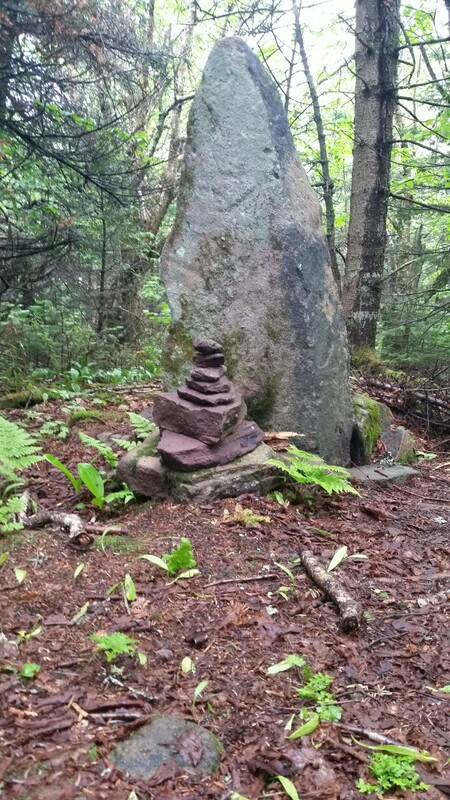 I hadn’t realized this when standing next to the cairn on the summit. I pulled out my map. The Balsam Mountain I had climbed lay to the southwest — nowhere near this tunnel, which leads north. 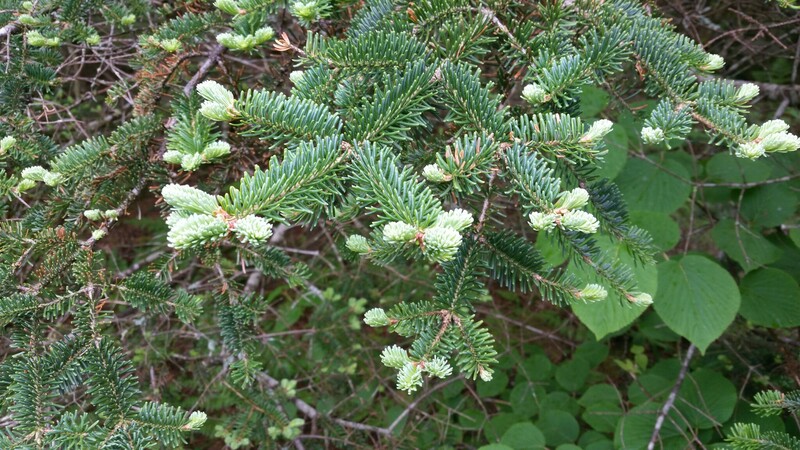 Perhaps there was another Balsam Mountain. But I couldn’t find anything on the map. During this weekend in the Catskills, certain secrets had been revealed to me, but not all of them. To learn more, I’d have to come back. Sometimes its journey to and from our destinations that have the greatest impression on us. I’m sure that no matter how many times you go back, there will always be new secrets that reveal themselves. And therein lies the beauty of it all. The other Balsam Mountain, with the Shandaken Tunnel, lies north and west of Mt Sherrill. Those who climb it usually do it as a traverse together with Sherrill and North Dome. Kevin, you definitely know your Catskills.